Experience a Fall Foliage that you will never forget! 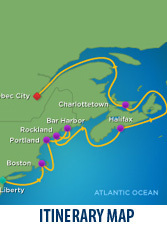 Join GlobeTrek Travel for an unforgettable Fall Foliage 12 Night Northbound Cruise up the Atlantic Coast. 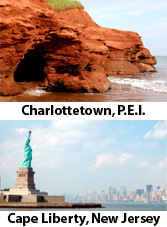 Visit 8 magnificent ports in Canada and New England! Book Early! *Rate does not include port charges and government taxes of $511.40 per person and is based on double occupancy. Inside rate is based on a category M. Ocean rate is based on a category H. Balcony rate is based on a category E1. Suite rate is based n a category JS. Rates are subject to change and are based on availability at the time of booking. Additional cabin categories and promotional rates may be available at the time of booking. A non-refundable deposit of $25 per person is required to reserve your stateroom. A second deposit of $425 per person is due by December 01, 2014. Final payment is due by July 01, 2015. Triple, Quad, Suite and Promotional Rates require the full $450 per person deposit at the time of booking. Space is extremely limited! Contact your GlobeTrek Travel Agent TODAY to reserve your stateroom.